This is one of my faves. It’s easy to prepare and you get intense flavor fast. 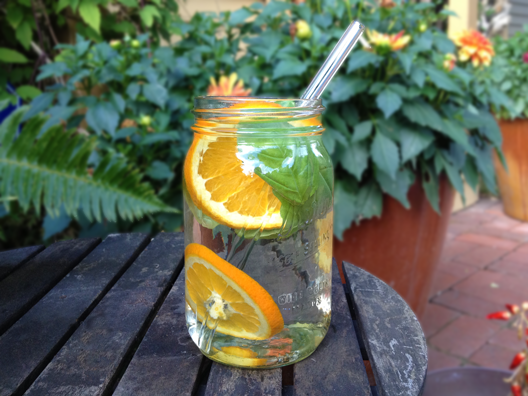 Make this infused water for summer gatherings or in the wintertime when you need a little taste of sunshine. 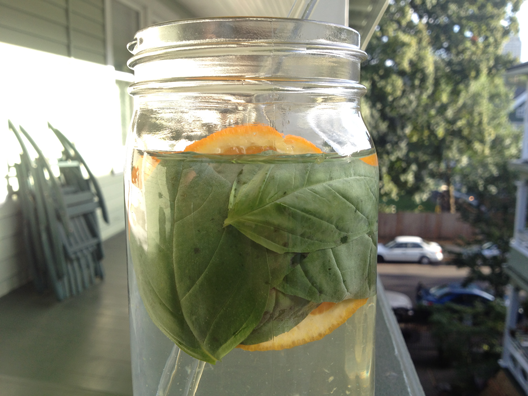 Recipe: for a 32 oz container: 2 organic orange slices + 6 fresh basil leaves. Pour purified water over the fruit and infuse at room temp for a half an hour, then enjoy. You can even put this infusion over ice without worrying about diluting the flavor too much. Or, put the infusion the fridge and infuse for up to 2 hours. The awesome straw you see above is a Glass Dharma Straw. 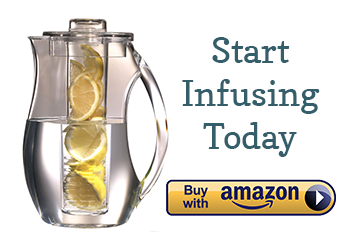 I use it all of the time when I don’t feel like straining an infused water. Straws naturally filter chunky ingredients as you drink, plus glass is the healthiest material for consuming any beverage. A note about basil: the leaves get brown spots really quickly, so if you are planning on serving this at a party, you may want to remove the basil before serving. 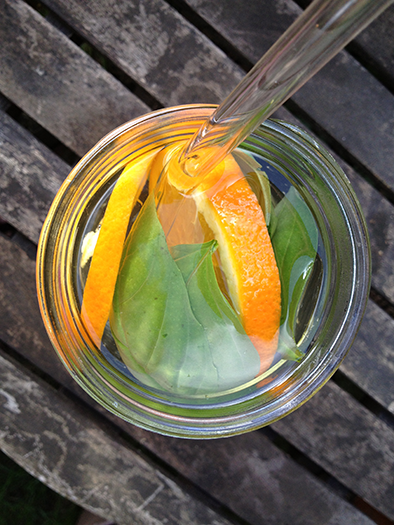 In the photo below, the infusion had only been at room temperature for 45 minutes – and the basil used had been freshly picked from a thriving basil plant just before making the water. The spots don’t affect flavor, just visual appeal. So excited about this recipe!!! I was just in my yard and picking the 2 things that grow abundantly and it ocurred to me that the smells worked together well and made me wonder what would happen if I put them together!!!!! So excited to make this! A spa I used to frequent made this kind of water & it was DELICIOUS!!! I can’t wait to make my own! Thanks for posting!